Very clean, modern private home; dog friendly; warm, comfy, close to everything. Billy looks kind of tired after skiing with Kevin & Dave! You can find Billy Kidd on the mountain most ski days at 1:00 pm at the top of the gondola; this Olympic silver medalist is the ideal ski ambassador for Steamboat and always has a story to tell. Kevin Miller and David Gates are equal partners in our home in Steamboat Springs; Kevin lives in Michigan, Dave, in Florida. We custom built our home in 1992 with rentals in mind, and named it "Fuller Daze Lodge"' in honor of our college friend and best skier we've ever known, Tom Fuller, who passed away in 1984. Through Tom, we discovered Steamboat in the 1970's, and as college roommates came to ski Steamboat several times before concluding that this is where we really want to be while vacationing in the Rocky Mountains. We have had many happy, repeat guests in our 26-year rental history! 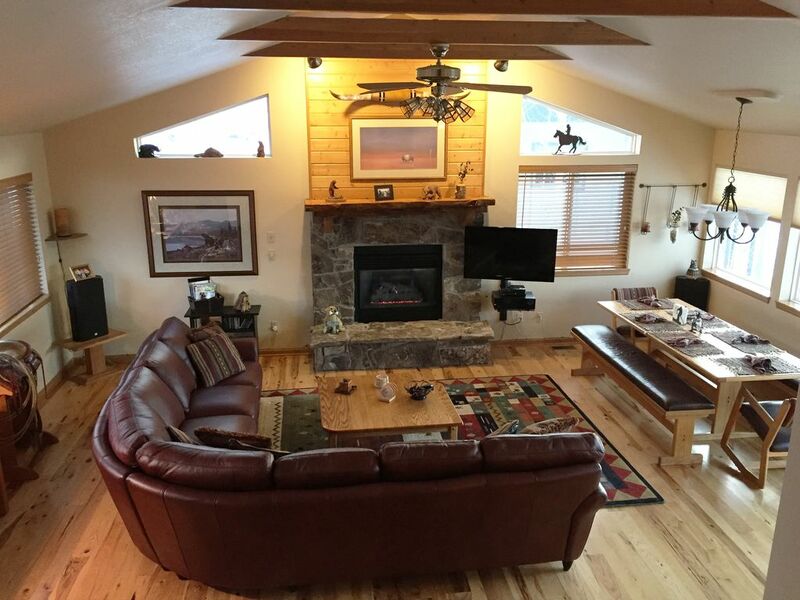 The views and privacy are truly what separate our home from the pack when considering a vacation rental home in Steamboat. We are on a private cul-de-sac of only 16-homes. The front of our home faces the ski mountain with views of the Gondola and National Forest, while the back of the home offers a large deck overlooking the Yampa Valley, Dakota Ridge, The Flattops Mountain Range and downtown Steamboat Springs, including the Sleeping Giant. Watch 4th of July fireworks from the deck as the music is simulcast on local radio, or stargaze while enjoying the private 7-person hot tub with these amazing views. Turn right out of the driveway to walk your dog around the dog-friendly cul-de-sac or left to explore a larger swath of the community. We have included all of the comforts of home, are dog-friendly and we enjoy sharing our favorite resort with family, friends, and with new friends. In fact, two former rental guests have since purchased property in the neighborhood! Quiet, peaceful views overlooking the Flat Tops Mountain Range, Dakota Ridge, Yampa Valley and downtown Steamboat Springs, including the Sleeping Giant. Great location to everything, no condo crazies to worry about, your own relaxing hot tub, your furry friend is welcome, and a wonderfully furnished home to make the whole family happy. toilet, and sink, with views of National Forest, Western decor. toilet, combination tub/shower, with oversized vanity, hair dryer, tons of towels. toilet, shower, jetted tub, Oversized vanity, lots of storage, towels, hair dryer. Stunning views of entire Yampa Valley on a private cul-de-sac ! Washing machine is an oversize commercial unit. Parking inside garage for one full size car; large driveway will accommodate 2 additional vehicles. Snow removal included at 4-inches accumulation. Secure, high speed wireless internet for entire house. Login information provided inside property. Clean, large cotton towels provided. We ask our guests to wash their towels before departure to save on turnover time and costs. It's OK to leave a load in progress for our cleaning team to finish up. Open floor plan with Gas Fireplace, Flat screen TV, Entertainment Center with DVD and CD player, leather sectional, reading chair, games, puzzles and books. Basic condiments such as salt, pepper, sugar, sweet and lo, some spices, cooking oil, etc. are provided. Best to do inventory upon arrival. Dishes and utensils provided; we ask guests to wash their own dishes before departure to save on turnaround time and cost. Updated kitchen with granite countertops, stainless steel appliances, sawn log breakfast bar, hickory floors, most condiments and spices provided. Dining area seats 8, breakfast bar seats 3. Flat screens in all 3 bedrooms, HD LED in living room. 140+ channels of cable TV available in living room and every bedroom. WFMU plays great classic rock music. A handful of reading material is on the bookshelf next to the fireplace in the living room. Puzzles, board games, card games, etc. in closet next to half bath on main living area. A few CDs are on the bookshelf next to the fireplace in the living room. Toboggan and snow discs kept in garage for sledding down backyard hill, but be forewarned, the walk back up is a challenge in deep powder! A dozen or so DVDs on bookshelf in living room. Gorgeous wildflowers abound in the back yard in the summertime. Bear and elk have been known to pass through the tall grass. The same field serves as a great sledding hill in winter! Lots of storage area in garage for toys, if you bring them. Fabulous bike rides in the neighborhood offer challenging uphill elevation change and downhill thrills. Easy bike to mountain and town. Beautiful 300sf Deck overlooks the Yampa Valley and Flat Tops Mountain Range. Due to the elevation, the views from this home are spectacular! Ski rack inside garage for drying skis/boards after a hard day on the slopes. Boot and coat rack in landing area for drying and warming boots, gloves, hats, helmets, etc. Home overlooks large Tennis facility; courts are just a short drive away. 2 Championship courses within 3 miles...the Haymaker and Rollingstone Ranch. Private Finnish Cedar Sauna on lower level soothes sore muscles. Extremely soothing Hot Springs 7-person Hot Tub on outside deck, under the stars. Enjoy all the comforts of home, plus a hot tub, sauna and jacuzzi tub in this exceptional vacation property! Very comfortable and nicely appointed with high-end western decor. Owners are organized, professional and easy to work with; we've been renting this property for 26-years. Steamboat Springs is known for its amazing champagne powder in the winter months, but has also become a wildly popular summer destination as well. Summer months bring beautiful spring-like temperatures during the day, ideal for any and all outdoor activities such as biking, hiking, hang gliding, golf, fishing, whitewater rafting, kayaking, jet skiing, sailing, swimming, hunting, water tubing, indoor and outdoor tennis, water skiing, rock climbing, hot air ballooning, shopping, eating and drinking. We are pet friendly, so your furry family members can come along on vacay, and enjoy the sights and sounds of Steamboat as well!